Get your Instagram profile in top-notch shape. Activate the latest Instagram Shopping feature so that your customers can purchase your products without leaving the app. Easily learn how to advertise your t-shirt business on Instagram and boost sales in no time. It seems like just about everyone is connected to Instagram nowadays and that’s great for your t-shirt business. Yes, you might get “accidentally” bombarded with pictures of your friends’ kids or their fancy vacay photos we can’t afford just yet, but Instagram’s latest features allow you to promote and monetize your t-shirt business by capturing people spending their time on this visual content first platform. You just have to know how to do it right. Luckily, we have developed a great guide to help you start making real t-shirt sales using t-shirt mockups and your Business Instagram account. The fashion industry is rocking Instagram, no doubt about it. While Facebook is having great success building communities with Facebook groups, people are not very happy with what they now see on their newsfeed while on Facebook. There are too many ads, too many baby photos, too much political content, etc. It just feels like Facebook’s ship has sailed. On the contrary, Instagram is having its best days. 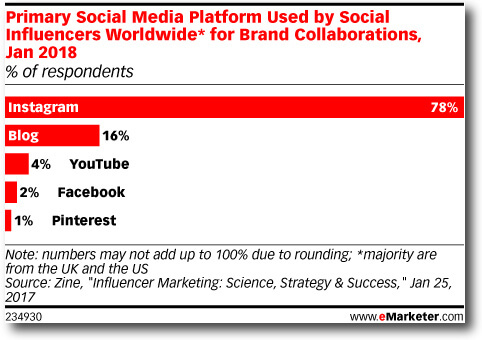 And let’s not forget about how big influencer marketing is on Instagram. There are so many beautiful, interesting, highly extroverted Instagram users that have decided to monetize their social media and interpersonal skills to reach out and connect with their tribes to become influencers, as we now know them. 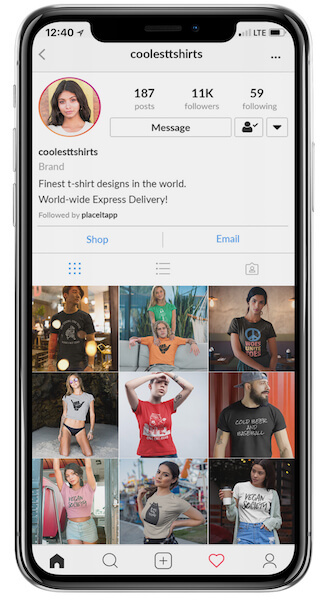 There is no question that Instagram plays a significant role in the discovery of new products and this is why promoting t-shirts on Instagram just makes sense. Think about it, one of your recent purchases was probably influenced by something you saw on Social Media! Alright, let’s get your (and my) t-shirt business ready for Instagram. I will first help you set up Instagram’s “hidden” e-commerce feature and then we’ll go over tips and tricks to help you have an Instagram account that stands out from the rest. To enable the e-commerce feature on Instagram you need to be selling on Shopify or Bigcommerce. You don’t have your own website yet? Here’s a getting started selling t-shirts with Shopify guide you might want to read first. Need to know: I first tried without luck to enable Instagram Shopping without connecting Shopify to it. Facebook says here that you don’t necessarily need to have your shop on Shopify or BigCommerce to enable shopping on Instagram. I tried and failed. So then I went and followed this Shopify guide which actually helped me step by step checking that I had every prerequisite to enable Instagram Shopping. If you currently have your t-shirt shop on BigCommerce then please check this guide. It feels like it was a matter of time until Instagram allowed its users to be able to sell and purchase without leaving the app. In the end, all kinds of merchants have been using Instagram to showcase their products and convince their followers into visiting their e-commerce website where they could actually complete the purchase. I guess it was just a matter of figuring out the best way of doing it. 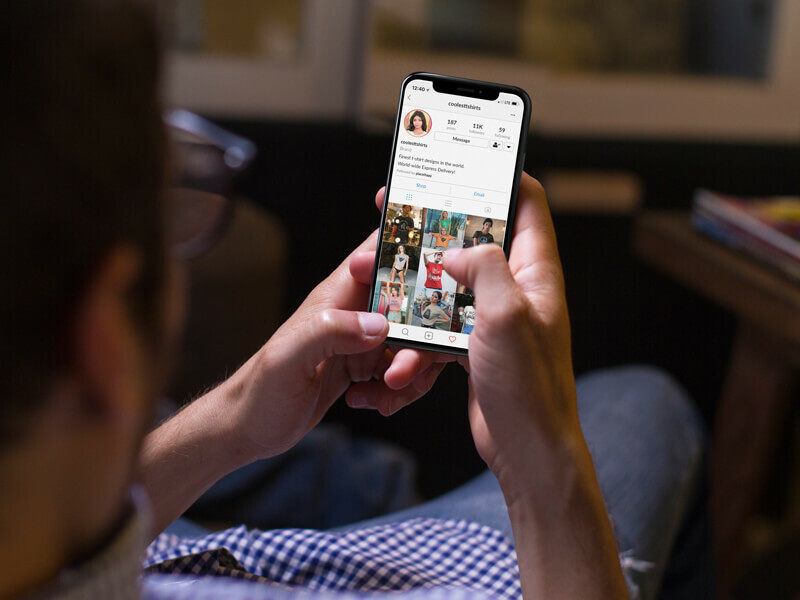 By partnering up with Shopify and BigCommerce, Instagram is able to narrow down their new service offering initially to proven merchants with an up and running shop on the mentioned platforms. This way, Instagram gets to forget about dealing with possible fraudulent transaction drama, customer service and these sort of business aspects present on e-commerce. 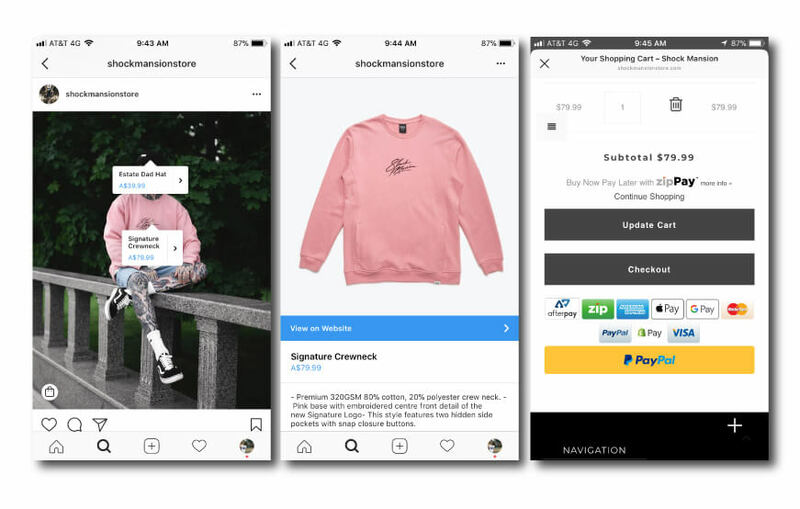 Instagram Shopping feature allows business owners to add “Shoppable Tags” in addition to the well-known “Tag People” feature. The shoppable tags allow Instagram Business Page owners to tag products on their images, display the item’s cost and lead the users through the rest of the purchase funnel without leaving Instagram. In a nutshell, when a product on an image is tapped, a price tag will appear. If the curious consumer is interested in learning more, they can choose to view the product details. Then there’s an option to shop now, which takes the user to the checkout page on the merchant’s Shopify website through Instagram’s in-app browser. Tip: Faster checkout steps = better experience = more sales = more revenue! Instagram Shopping is currently available to approved businesses in a few select countries. Check the full list here. Once you verify that your country is on the list you will need to follow the steps below. While it looks like a few steps, the process can take you some time to set up, in the end, it is all worth it. Visit the links at the bottom in case you get stuck in one of the steps while enabling Instagram Shopping on your Instagram account. A Shopify Shop on the Basic Plan or up. The Facebook Sales Channel enabled on Shopify. The Instagram Sales Channel enabled on Shopify. Have an admin role of a Facebook Business Page. An Instagram Business Account connected to the Facebook Business Page. The latest Instagram App version on your phone. Enable Product Tagging on Instagram. Settings >Business Settings > Shopping > Enable Product Tagging. A few troubleshooting and useful links in case you get stuck somewhere along the long and winding road. I’ve connected my catalog to Instagram. Why can’t I tag products in my posts? Tip: Once you create 9 shopping posts on your Instagram account you will automatically activate the Shop tab which appears under your bio. This button lets your audience get a quick-view of all your posts with tagged products on them. If you have less than 9 products shoppable tags will still appear but the shop tab won’t show just yet. Now that the shopping feature on your Instagram account is activated, it’s time to get followers, likes, reshares, views, and visits to your shop. Instagram Insights is the tool with which you will be able to constantly check the health of your Instagram Business account. It will allow you to see how many users visit your Profile, how many see your posts, the gender and age range of your followers, etc. You will find the Insights button at the top right corner of your Instagram business account. Make sure you use these valuable stats. As you may know, it is important to come up with a unique hashtag for your business and for your main products. On your bio and on your posts, encourage the use of your hashtag. Make sure you follow your hashtag so that you get a notification everytime someone uses it and thank them for it. While it is important to come up with your own hashtag you should also add hashtags relevant to your industry and your geographic location to increase the visibility and reach of your t-shirt business for free. You can add up to 30 hashtags to your posts but aim for quality and not quantity, I’d say try to use about 10 high-quality hashtags. Here’s a good hashtag tool to help you find Instagram hashtags. It’s good practice to put hashtags as a comment and not in the photo description. Your clients will not only use hashtags but they might even tag you in their posts. When they do, why not resharing this post! You can use an app like the Repost App which will allow you to reshare posts on your account and give your brand more trustworthiness. The content you didn’t create and that you can use for your business is called User Generated Content and it’s the best. It’s free and most times are high-quality, make use of it! To learn everything aboutuser-generatedd content check this post! It’s not enough to rely on regular posting and ads. Influencer marketing is one of the best ways to gain followers and improve sales. Influencers are a shortcut to the audience/demographic you are interested in selling t-shirts to. To put it simply, imagine you could get Dua Lipa to post on her Instagram account a cool photo of herself wearing your t-shirt design and tagging your Instagram account. You would immediately get a ton of teens interested in your t-shirts aimed at a teen audience. Do your research and find who has an Instagram account with a couple thousand followers and with a follower base that might be interested in your t-shirt designs. Generally, the more followers the more difficult and costly it will get to get them to promote your t-shirts, don’t get too greedy! I’ll show you how to find Instagram accounts with more than 1k followers that live in a certain area and that have relevant interests. You can do this with a simple Google search operator. 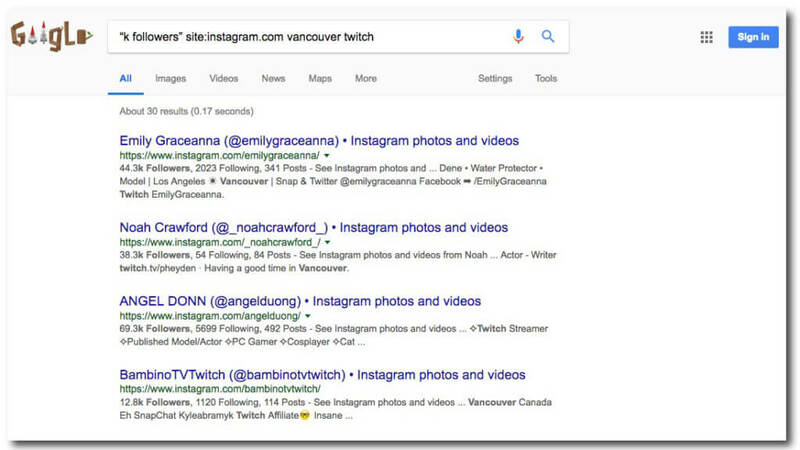 Copy and paste the following on Google and add keywords like for instance, “Vancouver” and “Twitch”. This way, you will be able to build a list with Instagram Accounts in Vancouver who enjoy Twitching who most likely have an audience of millenials who enjoy playing video games. E-mail them or send them a Direct Message via Instagram asking for their rates card or if they would be interested in promoting X t-shirt design for Z amount of money. Growing your followers base is not easy but it is not impossible either. Let’s first put some common sense into this endeavour. Would you follow an account with 1 or 2 images? No, right? As soon as you open your Instagram Business account you will want to populate your profile with +9 of your best photos which can paint a quick picture of your t-shirt business to your profile visitors. This will help you get the ball rolling, it will give authenticity to your brand and help you start getting a few followers. Chances are you had other Social Media accounts before Instagram and had some followers there already. If so, you need to let them know that you are now on Instagram. Create a few posts encouraging them to now follow you on Instagram where you will be posting great stuff. Every now and then post funny/entertaining content that will make your followers tag other IG accounts and hopefully then you will earn a genuine following. Collaborate with brands who have a following that might find your t-shirt business style interesting. Most likely, this will have to be a two-way deal meaning that you will have to also post on your IG account to promote their business and they will have to do the same to promote yours. This is a very good reason for always trying to get high-quality followers and accumulate a following that other accounts will desire to get access to. Spend a few minutes every day on Instagram and actually interact with your follower’s posts on your feed. Remember this a platform meant to socialize, not just sell sell sell! Follow the followers of your competition or from a related businesses. Follow accounts that comment on posts of your competition or related business. To make this even more effective not only steal followers but also interact with them by leaving a nice, honest comment on one of their posts. By doing this you will be forced to look at their Instagram account and see if their posts “tell” if it is a suitable person for your brand and will look more genuine. I haven’t personally checked this tool to grow Instagram followers yet but I’m thinking of doing so soon, I’m especially interested in the “unfollow everyone who doesn’t follow you” feature! Use it at your own risk, this kind of tools never last and it might be for a reason. The image or video shared is of high-quality and looks professional or natural. It wows you. The image or video shared caused a reaction in you. Either it made you feel something, made you realize something, etc. You support whatever the post is about or you are interested in getting more posts related to the post. Appeal to your followers better by at least being able to tick one of the checkboxes above. Also, don’t forget, authenticity goes a long way. You are never alone on the internet, be genuine and you will get the best results! When you open your Instagram app what is one of the most prominent top elements on your screen? Yup, Instagram Stories, and they need to be part of your strategy. Instagram made a great move in 2016 by adding Instagram Stories to their already cool offering. Around 250 million Instagram stories are now seen every single day, surpassing Snapchat, the creator of this format. 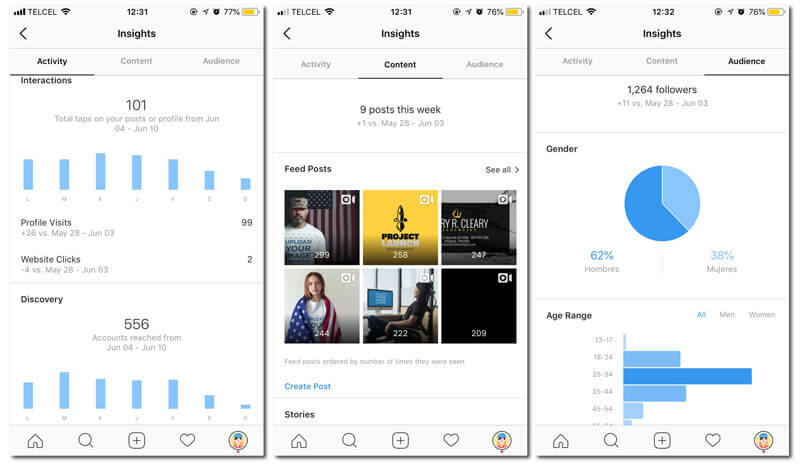 Instagram Stories last for only 24 hours encouraging for timely content like behind the scenes content and special announcements. Add hashtags and a location tag to your Stories. You will be able to be discovered through the Explore Tab and reach a much broader audience.
. Use this free advertising space to promote your t-shirt brand, share your best stories, share fun stuff or informational content, share exclusive promos, etc. Post with frequency, at least once a day. Let your customers (and Instagram’s algorithms) know your business is active. With the help of Insights, learn at what time your followers prefer to interact with your brand. Use an app like Later App to schedule your Instagram posts and allow for better scheduling. Tip: Include a clear Call-to-Action on the description area of your shared posts, e.g. “get this t-shirt design by visiting the link on the bio”. One of the most effective methods of getting high-quality Instagram followers is by organizing a t-shirt giveaway. Why? Because who doesn’t love free stuff! Organize your t-shirt giveaway in a way that participants need to not only like your post but also tag friends and/or reshare your post. This will allow you to reach a lot of users at the cost of a t-shirt or two. ✓ That your promotion complies with Instagram promotion guidelines. ✓ In which countries your t-shirt giveaway applies. ✓ The time period when your contests will run. ✓ Define what is needed to be eligible to participate. ✓ How the winner is going to be picked. You can come up with a dozen excuses for not investing in advertising. Maybe you are confident that frequently posting on Social Media is enough but that’s not true. 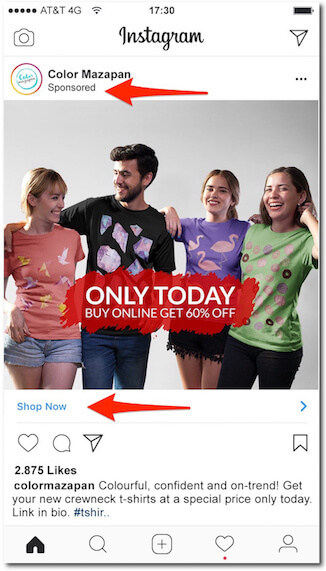 Instagram advertising can help you get the ball rolling when you are starting your t-shirt business and will help you steadily grow sales and get more followers too. Being able to reach an audience beyond your followers. Adding a tappable link to your ad allowing to take your customers directly to your shop. Reach an audience that will actually be ready to buy your t-shirts. While the Instagram Ads platform is intuitive and I’m positive you can do it on your own, it doesn’t hurt to first learn for free about advertising on Instagram directly from Facebook to avoid common mistakes and learn the basics. Tip: If you want to create an ad from scratch from the Facebook Ads Manager on your desktop or from the Facebook Ads Manager app on your phone. This is the most basic option for promoting your t-shirt business. On your Instagram profile, you will see a white button with the Promote label. By tapping on it you will be able to create a quick promotion featuring one of your recently published posts, you aren’t able to create a new post from here. Depending on your objective, you will be able to choose if you want to translate engagements into Profile visits or visits to your website. If you choose the More Profile Visitsit’s probably because you want to send people who interact with your ads to your Instagram account so that they are able to see the different available t-shirt designs on your Instagram profile and start following your account. But suppose you are investing in Instagram ads to sell the last few last pieces of a t-shirt design. You will then want to use an image or a video showing that t-shirt design and send the interested ones to your website. To do this, select the More Website Traffic option and copy and paste the t-shirt’s model URL where the visitor will be just a few clicks away from actually purchasing your t-shirt, our main objective. Facebook has so much information about you, me, and everyone with a Facebook and/or an Instagram account. Every like and follow we give is aggregated to a humongous database that stores our interests and preferences. When you select the Automatic Target Audience option you let Facebook’s algorithm choose who to show your promoted post to. Fear not, trust the robots! While you might feel like losing control, Instagram Ads automation can work pretty well. As previously mentioned, Facebook knows a lot about its user base and it will do its best to target the users that are more likely to be interested in your offer. Moving on, let’s say you have a niche t-shirt design idea where you want to sell cool baseball t-shirts to male NY Yankees fans. It wouldn’t then be too crazy an idea to choose the Local Target Audience option and target male Instagram users in a 5 mile radius from the stadium. Not bad at all, huh? Follow this same logic to promote your t-shirts to an audience in a specific geographic location. Finally, if you choose the Manual Target Audience you can personalize your ad delivery to the maximum. You can choose to target users on a certain or several geographic locations and with one or several different (or no so different) interests. Remember, the better defined you have your ideal customer, the easier the advertising process becomes. Check the Insights tab to learn as much as possible about your current audience. On this final tab you get to decide how much money you will like to invest in your business and for how long you want your ads to run. Don’t allocate all your advertising budget to just one ad. Do the total opposite. Advertising is all about mixing different variables and analyzing the results. You will want to run several ads different ads where you get able to test different images or media, different interests, or different targeted locations on your ads. You may have targeted the right audience but the imagery you used may not resonate with your audience or it could perfectly be the other way around. Thankfully, Placeit can help you with that. With thousands of t-shirt mockups featuring models of different demographics, you can very easily create beautiful to use on ads and inexpensively give your t-shirt brand that pro look. Never assume anything, never stop testing, and once you achieve a low ad cost and high sales, invest even more on ads until you see finish your t-shirt stock. The Instagram advertising campaigns that will help you boost sales are: Traffic, conversions, and catalog sales. These campaigns are aimed to increase visits to your website. With the help of the Facebook Pixel you will be able to create conversion campaigns and be able to get charged for ads only if a visitor completes certain action such as visiting a specific page on your website, adding a product to the shopping cart, or even successfully completing a purchase. Make sure to set your Facebook Pixel up in Shopify’s settings. The different available Instagram Ad Types are photo ads, video ads, carousel ads, and stories ads. Again, test and try which of these type of ads gives you the best results for your t-shirt business and double down once you hit gold (low cost, great returns). Keep in mind that seasonal ads are great for business. Let’s say you’re having a Black Friday sale. Why not get your customers excited about your low prices by advertising your slae couple weeks in advance with eye-catching Black Friday ads? There are seriously tons of possibilites, so keep an eye on trends, especially seasonal trends. Placeit helps you get a beautiful Instagram profile and a profitable t-shirt business. It allows you to showcase your t-shirt designs on the best light possible. With a plethora of tools all available on the same website and with the new Unlimited $29 Plan, you are able to thrive in the t-shirt business with ease. You can use all of Placeit’s tools to create not only t-shirt mockups, but also to create a whole brand for your t-shirt business. The t-shirt mockup generator tool can be your everyday tool. With this awesome t-shirt tool, you can createa t-shirt mockups every day and have fresh content to share daily. Forget about organizing photo shoots or waiting until your t-shirt designs get actually printed on t-shirts. This is how your Instagram Profile could look! T-shirt video mockups are as cool as it gets. Without needing to have any video editing skills you can put your t-shirt designs on models. Audiovisual content can be easily shared on both Instagram and Facebook and will allow you to start making sales on YouTube too. Go try this awesome for yourself. One of the most difficult things about being a successful -t-shirt seller is continuously producing t-shirt designs to actually put on t-shirts. We detected this huge pain point in t-shirt sellers and started creating several t-shirt design templates you can customize super easily. Have a look at some t-shirt designs done with Placeit’s t-shirt design templates below. Once you are ready, go ahead and try the tool for yourself! Instagram is 2018’s coolest Social Media platform, no doubt about it. If you are not getting customers from Instagram yet, it’s about time for you to start using this social media platform. I hope you’ve found this t-shirt business Instagram guide useful, feel free to share it and ask questions in the comments section below. So, tell us, were you able to tag products in your Instagram posts and create a beautiful seamless shopping experience for your customers? Have you started investing in Instagram ads? Try also our Step up Your Insta-Game with Fabulous Templates to get inspired on awesome post ideas for your Instagram account! Use this online design tool to make your life so much easier. Don’t stop there! you can also upgrade your Insta Stories posts with amazing templates for images and videos! Are special seasons coming up? Get ready for Valentine’s Day with these lovely ideas. Instagram is all about beautiful visual content. Placeit allows you to have your Instagram profile looking at its best. With tools like this, selling t-shirts becomes as easy as pie. Go ahead and visit Placeit to grab the tools that will allow you to thrive on the t-shirt business ecosystem. "My Instagram profile looks great with Placeit's t-shirt mockups."